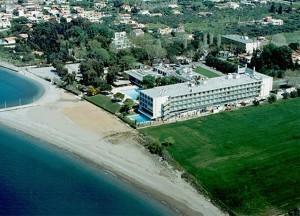 The Porto Rio Hotel & Casino occupies a 35,000 square meter area surrounded by green and facing the sea. It is a total casino resort facility and includes a variety of dining options, first-class services, plus elegant and comfortable rooms in several locations on the grounds. The total accommodation capacity of the Porto Rio hotel complex is 225 rooms, which are situated in the three-storey main building, or on the grounds of the village in a two-storey block, or as individual bungalow-style units. In the main building, you'll find most of the facilities and services of the resort. For convenience, there's a Mini Market with newspapers, magazines, gifts and souvenirs, as well as general commodities. The casino is situated in this building, along with all of the dining facilities. The main restaurant serves a buffet breakfast, lunch and dinner. There's also the a la carte restaurant for lunch and dinner, with indoor or outdoor seating overlooking the pool. The main bar operates all day during the winter, and the pool bar is available during the summer months. The resort offers a Spa and Health center with pool, Jacuzzi, fitness equipment, and a variety of massages and treatments. The casino is situated in the main building as well, and offers every casino game, plus 311 slots.The casino encompasses 1500 sq. meters and is open round-the-clock. In the main building, there are 132 rooms and suites, which are accessed by four elevators. Rooms have sea or mountain views. The separate two-storey building has garden and mountain views, and the independent bungalows are of one level design, all with garden access. Room amenities for all accommodation include air conditioning, radio and color satellite television, direct-dial telephone, Wi-Fi Internet, mini bar, private bath with hairdryer and personal amenities, soundproofed windows, and balcony or patio. 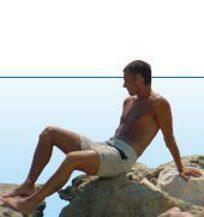 The resort is situated 8 kilometers from Patras City.